Last Christmas, not knowing what to buy me, my sister-in-law got me a gift card to Game Stop. Which was super nice of her, back in my gamer days, that would have been the perfect present. I just don’t have time for games, though I would like to get back into using my X-Box 360 for more than just a device to watch Netflix and Hulu. Today, I would have bought Forza Horizon 2, as my son really likes the demo that I downloaded, and the game would be fun to play together. 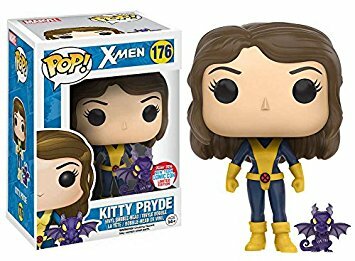 Last year, one of the San Diego Comic Con exclusives was the Kitty Pryde and Lockheed Pop Vinyl. I knew I would have wanted it, if I could get my hands on it. Our local Game Stop did get one, as we live in the age where comic convention exclusives are exclusive for that weekend and some of them come to specialty stores. Unfortunately, by the time December came around, our local Game Stop didn’t have it. BUT! We live in the world of online stores and I quickly spent my gift card and got this in the mail, like a week later. I meant to take a picture of me holding it, but again, I’m the worst. My son also really enjoyed this and kept losing Lockheed, so when we moved this latest time, I put this in a box and haven’t seen it in a few months but it once, proudly, sat on our bookcase, for quite some time.